The University of Rhode Island Police Department has teamed up with students to bring the first ever URI Police Student Advisory Committee to campus. The committee is currently composed of about 16 to 20 members, all representing different aspects of the University community including Greek Life, commuters, Talent Development, BOND, Housing and Residential Life, the Women’s Center, new student programs, URI 101 and more. Mario McClain, a URI alumnus, put together the framework for the committee. He came up with the mission statement, figured out what the big picture for the group was and worked to get a representative from almost every outlet on campus. This idea came after Major Michael Jagoda was wondering how they could improve community policing. “[It offers a] better connection between the students and the police officers to let [students] know not all police officers are bad,” said Kenny Roca, a junior and a member of the committee. Benzan added that it helps to eliminate the bias that some may have and allow students to know that the officers are here to help and to keep them safe. This is the first time something of this nature has been on campus. The Police Student Advisory Committee offers students a direct link to the police department to bring forward their concerns and ideas. The committee has already helped to resolve a few problems and have other ones being worked on right now. Those issues range from concerns about lighting and crosswalks on campus to off campus issues commuters may have. The Police Student Advisory Committee will work to address issues both on and off campus. One of the big points of the committee is to give the students a voice, a sentiment that a few of the members echoed. Major Jagoda is the only officer who sits on the committee, so the concerns go directly to him. “This is a good way to hear the feedback and make sure we’re doing the right thing for the right reason,” Jagoda said. He added that it is helpful that the students are also being advocates for the police department. The committee is planning to start meeting twice a month. The meetings are typically open to anyone who wishes to go. They are also currently working on social media accounts and planning different events for the URI community. The committee is also developing a SafeRide app that students would be able to use like Uber. The members also stressed that this is open to anyone and everyone. The committee allows students to give back to the community in a different way, get to know members of our police department and can open the door for internship opportunities. Members have joined for different reasons, including a desire to give back to the community before graduation, making campus safer for everyone and wanting a hand in making sure people feel safe. 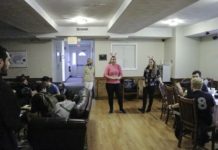 “In order to give back, we have to give students a voice or give them our voice to be heard,” said Matthew Marwell, a junior and member of the committee. The committee also offers a hands-on experience that some may not have gotten otherwise. “[It’s] a good way to get your feet wet in the field,” Christian Concessi, a senior criminal justice major, said. For those who wish to be a part of the URI Police Student Advisory Committee, they can reach out to naomi@uri.edu. People are also able to check out meeting minutes from past meetings on the URI Police Department’s website, web.uri.edu/publicsafety.